I’m not really a jazz person. But Jean-Luc ‘oboman’ Fillon certainly is. When you get in to around 4:20 or so you see him playing the Marigaux “Altuglass” oboe. I’ve always wondered about the clear oboes. I’m not sure I want to see the inside of my oboe after I’ve played for a while. I do know, though, that several oboists I respect rave about them. I have it SO easy, I know. I live close to where my main gigs, and I rarely get offered jobs that are a drive away. Many of my colleagues have to drive about an hour each way for work. I think I’d be a basket case if I had to do that too frequently. I just read an article (that I am certain I also read a while back so I hope this isn’t just a repeat … did I post it earlier? Anyone?) about an oboist who used to fly back and forth to his orchestra job. When I moved to California, I still had a home in Portland and didn’t plan on staying in California forever. So I opted to stick with the program and flew up here, it averaged three or four flights per concert. It was kind of tough. I’m glad to be back in Portland. Yikes … I can’t even imagine! While we were in the Bay Area, we had to move a couple of times, and at one point we stayed in a motel. That’s how I got to meet and study with Marc Lifschey, he was the San Francisco Symphony’s principal oboist from 1965 to 1986. When we were in the motel, I was practicing in my room, and this woman knocked on the door. She was a cellist, and she introduced me to Lifschey. I didn’t know anything about him, but he took me on as a student. Lifschey was the main influence on me. He was one of the world’s top oboists. He studied with Marcel Tabuteau at the Curtis Institute of Music in Philadelphia and played with the National Symphony and the Metropolitan Opera Orchestra. He was the principal oboist with the Cleveland Orchestra during the Szell years from 1950 to 1965. Marc didn’t spend all that much time on technical stuff, and none at all on reed-making. He hated to make reeds. Often you spend more times making reeds then actually playing. Marc was more interested in tone production and musical line. I spent a lot of time with him learning how to play musically. Gee, Dante Perfumo played in San Jose Municipal Band when I was doing that in my later high school years. He was quite the eccentric! And of course any oboist will recognize the name Marc Lifschey! The most important thing I got from him about music is that it is something that is a legitimate way to make a living, and it’s something that must have a discipline behind it. As a kid, many times I would come home from school and dad would be working on his compositions, writing an oratorio. I remember his musical notes were quite beautiful. So I considered it something not to be taken lightly. It’s something you do because you have something to say and feel you have a story to tell. What does the cor anglais (english horn) sound like? To me, a flat trumpet. Diego Stocco – Music From A Dry Cleaner from Diego Stocco on Vimeo. Yesterday I went to Cinearts at Santana Row to see and hear the LA Phil play Mendelssohn, thanks to Fathom Events, who contacted me and offered me a media pass. Or at least that’s what the email said. I arrived at the theater and the house manager said she knew nothing about a media pass for anyone. This happened to me the last time I went to a Fathom Events broadcast. Hmmm. What’s up with that? Fortunately the house manager let me in anyway, for which I’m quite grateful. Prior to the start of the event we heard about the value of orchestras in cities, and the short clip encouraged everyone to “support your local orchestra.” That same message was relayed during intermission as well. I approve! We also heard an orchestra warming up, but I’m not sure that was live, as they were playing excerpts from other works, including Beethoven 7th. It was fun to hear the oboes practicing some things together in any case. 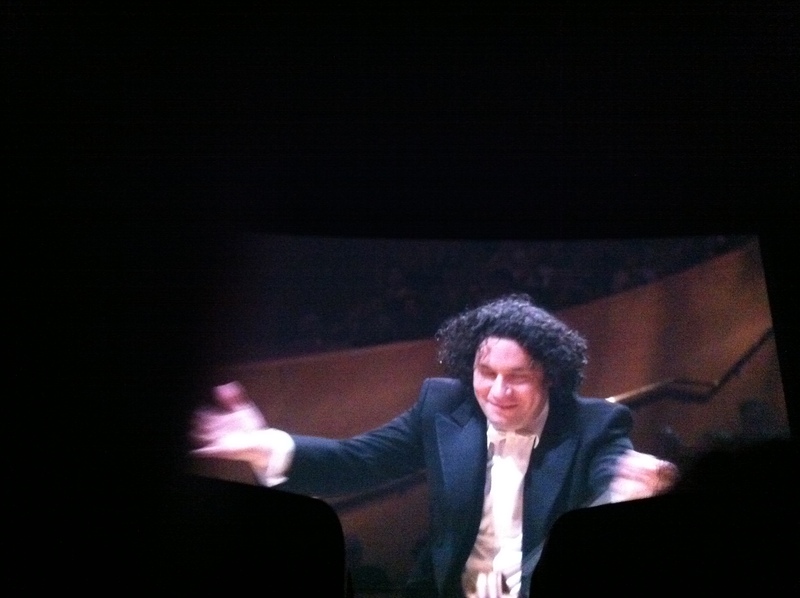 When things started up we heard first from Maestro Dudamel. He is one charismatic man! He’s also quite witty. Everyone in the theater (the number was quite small, however) was cracking up at times. We were shown clips from a rehearsal, which was great fun to see and hear … sometimes I’m more interested in those than the actual concert (bad me?). On the all Mendelssohn program was The Hebrides Overture, Violin Concert in E minor with Janine Jansen, and Symphony No. 3 in A minor “Scottish”. I don’t do reviews, as you all know, but there are things I noted in this concert. The way the trumpets are sitting, the back legs of their chair are short and the front long, due to the risers. I’ve never seen that before. No big deal … just one of my wacky observations! When we make a small little bloop we know not to shake our heads or react in a way a live audience can see. But with the big screen, we can even see a musician make a slight face when he or she makes a mistake. In this case it was merely a little squint, but yes, I saw it, and no, I’m not going to tell you who it was that did that. The women sure wear a lot of sparkly clothes. At one point in San Jose Symphony we weren’t allowed to. I didn’t find it a distraction at all with the LA Phil. You can see when someone fingers are shaking even slightly. Nerves hit everyone, yes? During intermission I saw a woman pulling her top away from her to let some air in and commenting to the person next to her. I’m pretty sure she was saying it was very hot. I wonder if it’s warmer when they are doing a live broadcast. I love the principal bassoonist‘s glasses. (Yes, I look at those things, being a glasses wearer.) The temples are black and white checkerboard. Very fun. I loved that the musicians and Maestro Dudamel turned around to acknowledge the people in the “orchestra view” section behind them at the end of the concert. Twice the screen froze and the theater audience reacted with a bit of a gasp. The first was during the violin concerto and the second toward the end of the symphony. Yikes! Oh … and for you oboists, Marion Arthur Kuszyk played principal on the first half while Ariana Ghez played principal for the Symphony, and Anne Marie Gabriele played second for the entire concert (if I was seeing correctly). Is going to a movie theater the same as going to a live concert? Not at all. I enjoy it, but it’s not the same. You are “told” what to see. You are even told what to hear, really, both by the camera and by the way it is miked (mic’d?). I used to say the camera should just be in the audience and remain stagnant, but I no longer feel that way; a broadcast in the movie theater is just a different beast than a live concert. And no, I didn’t take any photos, text or tweet during the performance. I did pull the camera out for bows, though!